Did you know I brush my teeth? Well, my HuMom does it for me, but it’s part of our evening routine. 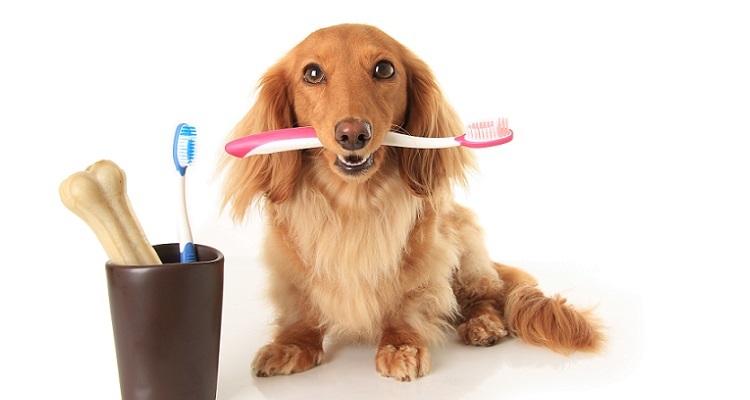 Good oral hygiene is as important for us dogs as it is for you humans. A bad tooth can lead to infection. There are commercial toothpastes made just for dogs which is what we use. I would not recommend this recipe for my fellow epi-warriors due to the salt content but for the rest of you canines today I’ll show you how to make a super easy homemade paste that hopefully you will love. Take one bouillon cube & dissolve it in warm water (about 2 cups). This will make the mix tasty. Add some baking soda to the bouillon & stir. Baking soda is an abrasive that will help remove plaque. Next, add organic coconut oil to the mixing bowl & stir until the mixture is even. Coconut oil ties all the ingredients together, & is safe for your dog. Store your doggy toothpaste in a resealable container. The mixture can be stored at room temperature. Now you can brush your good dogs teeth & keep them in tip top shape. Check out our good friend Dista of Critter Comforts two short videos about cleaning your good dogs teeth. Video 1 Tips on how to brush your good dogs teeth. Video 2 How to brush your good dogs teeth. A final thought, if your good dog simply hates the taste of any toothpaste, you can simply use a piece of gauze. Gently rub the teeth with the gauze or add a dab of organic coconut oil. A bit of coconut oil on a finger can help too. This can be done with any dog, even epi-warriors like myself. Many thanks, for the recipe, Olivia. We’ll pass it along to households without epilepsy-warriors too. I will have to try this for the boys. They enjoy getting their teeth brushed although it did take Pierre some time!